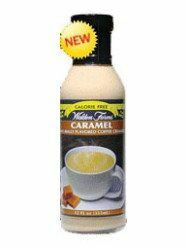 Rich natural flavors make all six Walden Farms Coffee Creamers taste incredibly delicious. Great in coffee, smoothies, iced coffee,milk and more. INGREDIENTS: Water, Food Color, Carrageenan, Sucralose,Cream Flavor (Non Dairy),Sodium Acid Sulfate,Potassium Sorbate,Sodium Benzoate (To Preserve Freshness),Xanthan Gum, Salt, Caramel Flavor, Coloring.